Campers in Canada and the United States are fixated on petroleum-based stoves. The majority of us use either pressurized white gas or butane/propane stoves. There’s nothing particularly wrong with that. I love my MSR Dragonfly stove. But everywhere else in the world it’s alcohol stoves that rule. I remember back in the mid-1980s exclusively using an alcohol burning stove - Trangia - while working at a kids camp. My boss insisted on them - and they worked great for our multi-day hiking trips. But somewhere in between I switched to petroleum - so did my past boss. So last week I wanted to give the Trangia another try. Trangia stoves are one of the top selling alcohol burning stoves across Europe. In Canada, however, it was difficult to even find a store that sold them. Canadian Outdoor Equipment came to my rescue. I’m totally addicted to this store. It sells outdoor products you won’t find in any other outdoor store - like the Trangia. The stove itself has many advantages. First, it’s extremely light weight. It fits in the palm of your hand. It also comes with its own cook set and is quite compact, which is why we used them for our hiking trips at the kids camp years ago. They’re also very simple. What I mean is, there’s nothing much to them and nothing much can go wrong with them. To me, the Trangia resembles a fancy Fondue set. And most of all, they’re unbelievably silent. My MSR Dragonfly is so loud when turned on that some of my camp mates refuse me to pack it along. There are some disadvantages though. Depending what fuel you use, it’s difficult to see the flame when its on. Mythel-hydrate is the worst for this. It also has a longer boiling time then all pressurized petroleum based stoves. And, because they’re such a rarity in Canada and the U.S., it’s a tad confusing to know what fuel to purchase for them and where to buy it. To help explain all this, here’s a blurb [below video] I got from the gang at Canadian Outdoor Equipment. It helped me a lot when trying the stove for the first time since the 80s. There's a fair bit of confusion out there about what exactly can be used as fuel in Trangia cookstoves, what that fuel is called, where to get it, burn times, etc..This post is an effort to clear up some of these questions. Out of the box, Trangia cookstoves burn alcohol and derivatives (see below). Attachments are available to allow the stoves to operate with isobutane canisters, or petroleum fuels and derivatives (white gas, gasoline, kerosene and diesel), making it a very versatile system, compatible with a wide range of available fuels in Canada, and around the globe. I have a feeling that the naming of alcohol compounds was accompanied by much imbibing of the substance, as there are a myraid of names for alcohols that are actually the same thing. Add in the conundrum of some being available only in Canada, and others only available states side, it can make your head spin - even while sober. METHYL HYDRATE: known also as methanol, wood alcohol, or wood spirits, or gas line anti-freeze. No longer distilled from wood, but instead reformed from the methane in natural gas, this clean burning fuel is widely available at hardware and paint stores across the country, and provides the best power density of all the fuels we tested. It is however poisonous (don't drink it, or spill it into waterways) and can be absorbed through the skin, so care should be taken when handling it. Trangia's 500 ml or 1L bottles are perfect for storage of fuel (alcohol or petroleum) and refilling of the stoves, as the push button on the spout ensures there are no spills or drips. 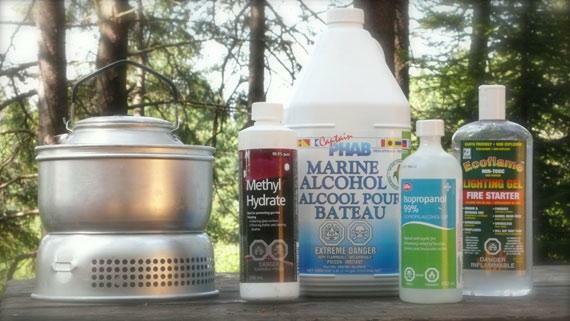 MARINE STOVE FUEL: also known as denatured alcohol, it's ethanol (the alcohol in booze) mixed with methanol. The methanol is added to prevent people from heading down to the local marina on a Friday night instead of the liquor store. This burns cleanly as well, and had nearly the same burn times as methyl hydrate. GEL FUEL: generally used for fondues, it can be used in a Trangia stove, but I would only use it if i had absolutely nothing else. The burner cup has small holes designed to improve the burn of fluids, so gels don't take advantage of this. In addition to the slowest performance, gels also leave a residue in the burner that needs cleaning. Having said that, it is comforting to know that I could take some of my alcohol hand cleaning gel and make a cup of tea with it if I had to. For our burn time tests, we used a 25 series windscreen, the stock alcohol burner cup, and the stock aluminum 0.9 L kettle. Tests were conducted at Algonquin Park in Ontario (approx 289 metres above sea level) in July (summer) at temperatures in the high 20's, low 30's. Test consisted of time it took to boil 750 ml of water, including set up of cookset from it's packed state. We did not test petroleum fuels in this run, as this will be a separate post later in the season. Methyl Hydrate is the least expensive fuel at about $2.60 per litre, marine fuel runs about $4.75 per litre, and isopropyl about $8.00 per litre. The above fuels are only ones that should be used in a Trangia stove. Fules that should NOT be used include: Varsol, Paint or Laquer Thinner, Turpentine or Mineral Spirits (don't let the name fool you, it's petroleum based). If you're a speed demon out on a camping or tripping expedition, and need hot water NOW, the butane attachment is a must have - a veritable blast furnace that when combined with the windscreen, goes from zero to hot brew in 2 minutes. Add another 2 for set up, and you've got morning coffee in under 5 minutes - quicker than I can do it at home. The down side is that isobutane tanks in Ontario are non-refillable, must be disposed of properly (i.e. a special trip to landfill site), and don't function well in sub-zero weather ( when I need 5 minute coffee the most). Great for quick, fast trips where every minute counts, but aside from being in the Eco Challenge, who wants to be rushing through dinner on a backcountry trip? The heat from the alcohol stove, on the other hand, in addition to being completely silent, makes for great cooking - no instant scorch like with pressurized gas, just nice, steady, even heat - perfect for sautéing veggies, or making frybread. Alcohol fuels will work in winter weather, (but must be lit with a flame, as opposed to a spark) are cheap, and readily available in smaller towns where other camping fuels may be in short supply, making the Trangia stove one of the most versatile cookstoves available today.